Many thanks to all supporting clubs. No late sign in will be accepted. 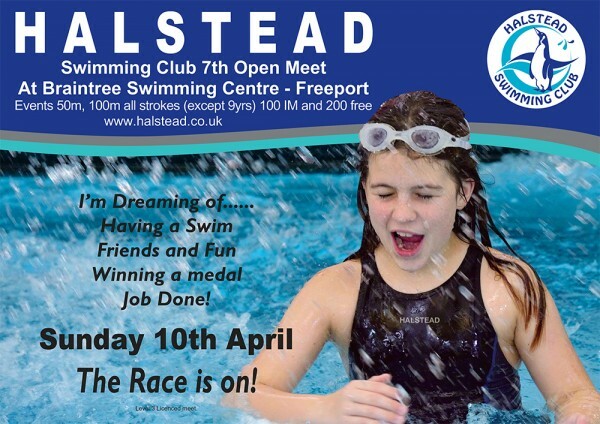 The Halstead Open meet is now closed and acceptance files can be downloaded here. All club representatives have received file info. 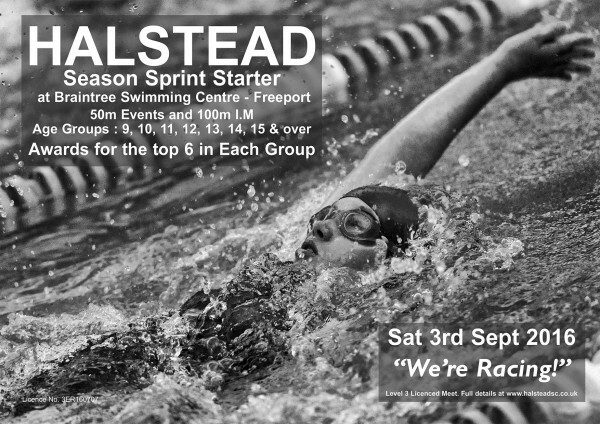 Further meet details including sign in, warm up and pre meet info is to follow. 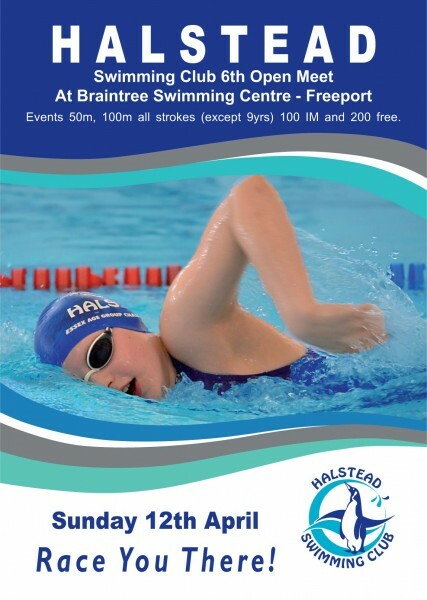 The 2019 Halstead Swimming Club 10th Short Course Open Meet will be held on Sunday 14th April at Braintree Swimming Centre at Freeport. The meet includes 50m and 100m for all strokes, 100m IM and 200m Freestyle events. This is a Level 3 Licence meet. Medals will be awarded to swimmers achieving places 1st - 6th in each single age group. There will also be Top Boy & Girl awards. This meet wil not be operated on a first come basis. HSC organise and run several Open Meets during the year. We always need help from Parents and members to ensure these events run smoothly and, as the saying goes, "Many hands make light work". There are many jobs that need to be completed. It would be great if we could see some new faces this year as helpers. You do not need any experience as there is always someone running a Team that 'knows the ropes'. Reception/Entrance - Selling programs, entry tickets, raffle tickets, cakes and refreshments. Everybody takes it in turns so that you can watch your swimmer when necessary. Signing in - All swimmers are required to sign in prior to the Meet. This information then gets passed to the technical team to input into the Sports System which runs the meet. Technical Team - Even if you are not technically minded (many people in the team are not, believe me), you can always learn how the Timing Systems are set up and work. Marshalling Area/benches - Swimmers are called for their respective 'Events' and, as with all Open Meets, the Sports System works out who should be swimming and when. At the Marshalling Area, all the swimmers will be told when to start moving to the benches and what lane they will be swimming in. At each bench, the swimmer will be checked by the respective marshal to ensure swimmer are where they are supposed to be before their swims. HSC Team Marshall's - Making sure swimmers go to the Marshalling Area for their events. Pool side refreshment - Arguably one of the most important jobs. Making sure the Officials, HSC Coaches and helpers have drinks and sweets on poolside. Runner - This is a one person job and doesn't actually involve running. At the end of each race the Head Official signs off the race result which then gets taken to the race control. At the end of each event, the event resulst need to be displayed for swimmers and separately for their doting parents to find out how their cherubs have done. Please download the full set of meet results now. Please see Donna at the pool for further details of job roles. We have team Halstead t-shirts for all volunteers. Please See Donna @ the pool on Friday. Please remember to register your car if you stay in the carpark for longer than 6 hours. NO ONE THE DAY ENTRIES WILL BE ACCEPTED. ACCEPTANCE DETAILS - Individual club acceptance files can be downloaded here. Please check all race/personal details carefully. Thankyou to all swimmes, spectators, coaches, officials and volunteers. 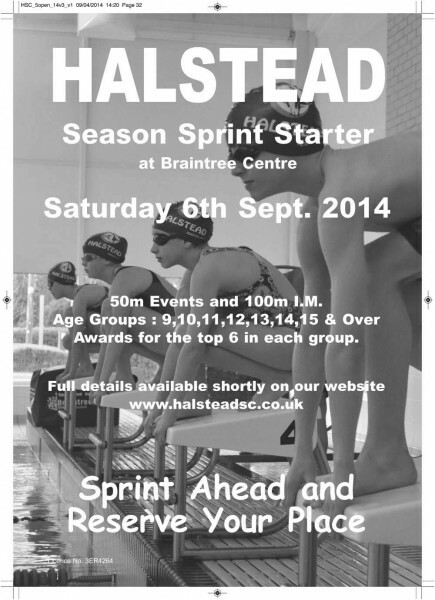 Many Thanks to all the Halstead Members that have volunteered to help on Sunday at the open meet. Any questions please see Donna at the pool. Please remember to register your car if you stay over 6 hours. Please download your clubs acceptance/not accepted files now. We were over our license running capacity obe all entries processed. This meant we had to introduce our oversubscribed policy.published within our terms and conditions. Entries may be partially declined if the numbers designated for each event are oversubscribed. In such cases lower cut off times will be introduced to limit entries. Not accepted entries have been isolated to the 200 free and the 100 IM in order to ensure all swimmers will still be able to compete. Pre - Meet info to follow. Awards will be for individual age groups and places 1 -6. Please download full set of results now. Many thanks to all those that supported this event. Many thanks to all those that have agreed to help at the meet. These events take a lot of help on the day so we really appreciate your help. Please read pre meet info and warm up documents carefully. 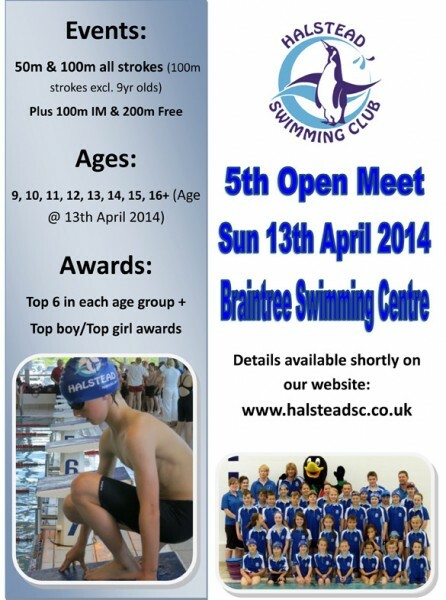 Special edition meet due to the closure of Braintree pool for our April event. Many Thanks to all those that have kindly offered to help. Acceptance and not accepted files can be downloaded here. 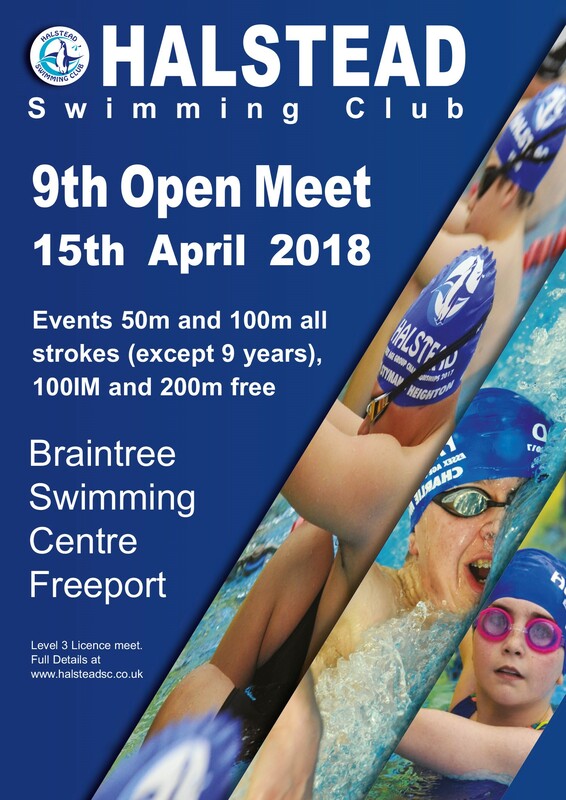 Due to the change in venues and the reduction in lanes our meet has been oversubsribed which meant we had to process our published "over the limit" criteria. The criteria states that "entries may be partially declined if the numbers designated for each event are oversubscribed. In such cases lower cut off times will be introduced to limit numbers. 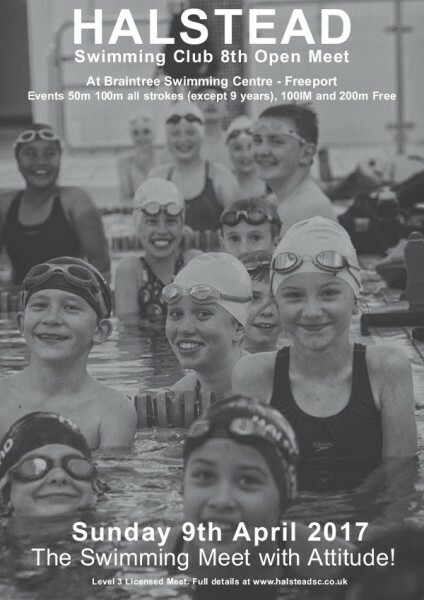 The not accepted - over the limit numbers have been kept to a minimum; we have removed the 100 IM for the 9 - 12 years. ALL OTHER EVENTS HAVE NOT BEEN AFFECTED. 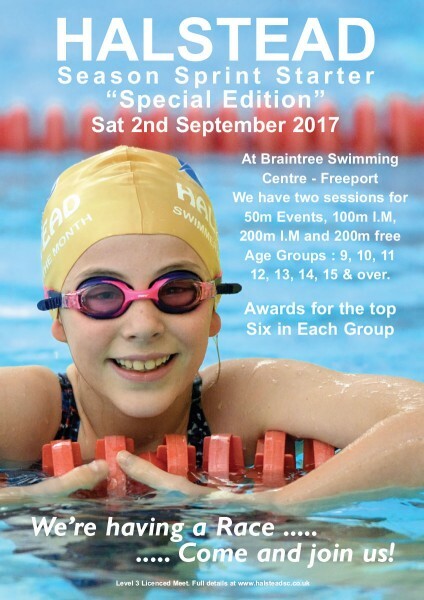 We were advised a few days ago that the Braintree Swimming Centre will be colsed for a 9 week period for urgent repair work to the pool. We have been busy seeking a new venue and have now confirmed a booking at Colchester Leisure World; this we believe is the best alternative in terms of location and all round facilities for all our regularly attending clubs. 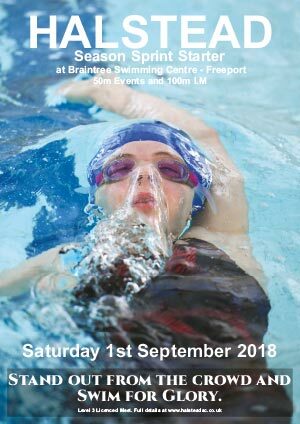 The pool does only have six lanes and will reduce the quantatity of swims; FOR THIS YEAR ONLY WE WILL BE REMOVING THE 200 FREESTYLE AND LIMITING THE 100 IM to the 9,10,11 and 12 year ag groups. We are sorry for any inconvenience that this may have caused in regards to processed entries; please accept our apologies, the decision especially in it's late notification has been completely out of our control. Documents have now been update and downloadable here. A new Sport System file will follow shortly. Awards will be for individual age gfroups and for places 1 - 6. Closing date for entries is Wednesday 1st March. Many thanks to all attending clubs for your support on Sat eve. We hope you enjoyed the event and we hope to see you April 9th 2017 for a 7th Short Course meet. Pre Meet info now available to download. Download warm up schedule now. Full set of results now available to view. Due to the meest being oversubcribed we had introduced lower cut off times reduce numbers on two events in order to stay within ASA license restrictions - 200m free and 100m IM. FULL REIMBURSEMENTS will be made for these swims. Please check your club acceptance files carefully; confirming all ok no later than 23rd March. 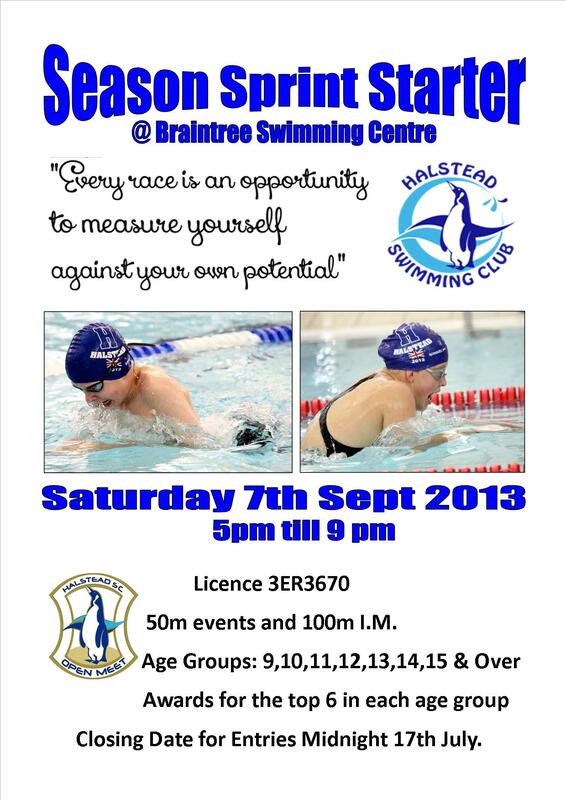 7TH OPEN MEET AT BRAINTREE SWIMMING CENTRE FREEPORT. Results now available to download. Thankyou to all that supported this event. Please add the April meet - 10/04/16 to your diary now.........details to follow. Download pre meet info now. PLEASE NOTE: SIGN IN COMMENCES 16:45 AND CLOSES AT 17:15. Please download full warm up details now. 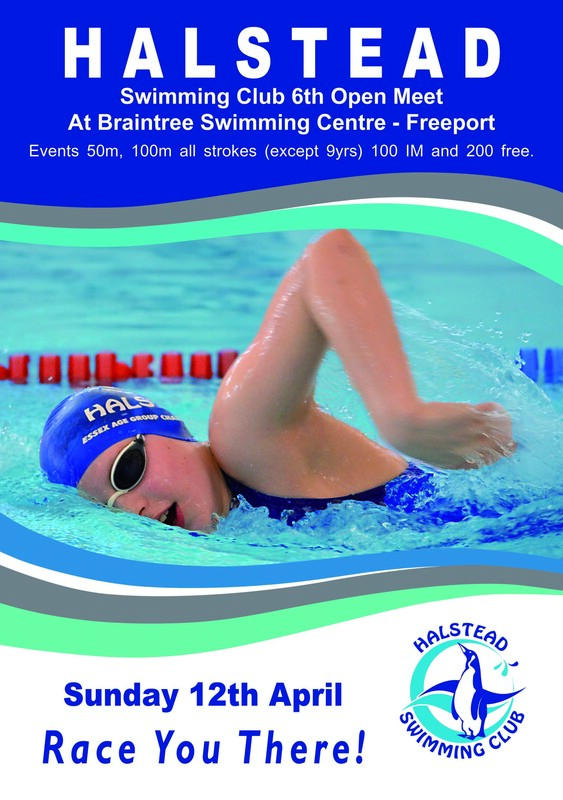 Thankyou to all visiting clubs - We look forward to welcoming you to Braintree on the 5th. RESULTS available to download here. Many thanks to all our visiting clubs! We hope you enjoyed the day and had lots of succesfyl swimming! Withdrawals are isolated to the Individual Medley. The meet is now closed and we are @ full capacity. Minimal withdrawals have been made in order to adhere to ASA guidelines; these are isolated to the Individual Medely event. Please view all acceptance details and please notify us NO LATER THAN WEDNESDAY 25TH MARCH - DETAILS WILL THEN BE SENT TO PRINT. Pre meet info including warm up schedules to follow. Many Thanks for all entries/support. 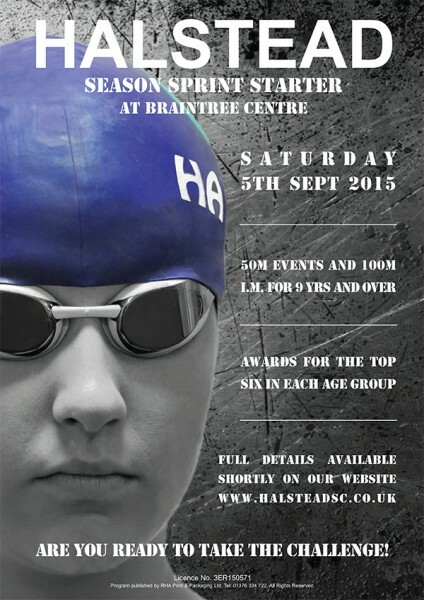 Join us for our 6th open meet..........A celebration of 50 years of HSC. Many thanks to all HSC Volunteers and Officials. A big thankyou to the visiting clubs for their support. pre meet info downloaad here. Warm up estimated @ 18;00. Pre Meet Info to follow. EVENTS - ALL 50M STROKES AND 100 IM. WARM UP 18:00 - A ONE SESSION EVENT. AGE GROUPS: 9, 10, 11, 12, 13, 14, 15 & OVER. AWARDS FOR THE TOP 6 IN EACH GROUP. SPRINT AHEAD AND RESEVE YOUR PLACE!!!! Many thanks to all participating clubs for helping to make our annual meet an enjoyable day. Many thanks to the team of Halstead helpers and Officials that have made this event possible. Warm up times and sign in info now available to download. Please remember sign in will close promptly @ the published times. Contact number for the day. Full club files now available to download now. Due to the meet being oversubscribed a rejection criteria was introduced lower limits were introduced in the 200 free and the 100 IM. Please check all entries by Wednesday 25th April. Any questions please e-mail Donna on dsdtdkjwhall@tiscali.co.uk or on 07759191488. Please download full details now. Halstead Closing date Monday 31st March. All entry forms to be returned to Steve Dayes, Donna Hall or placed in the secure HSC box. Many thanks to all supporting clubs!